The building of empires has been part of many religious groups' strategy throughout history. But no one does it better than Scientology. 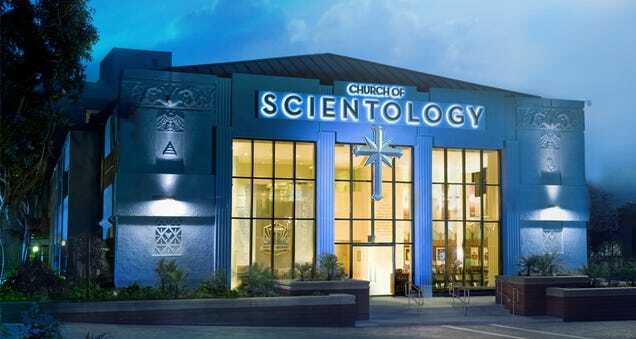 New documentary Going Clear: Scientology and the Prison of Belief debuted in the US over the weekend, and offers the first in-depth survey of Scientology's practices, including its ongoing quest to acquire high-profile property. 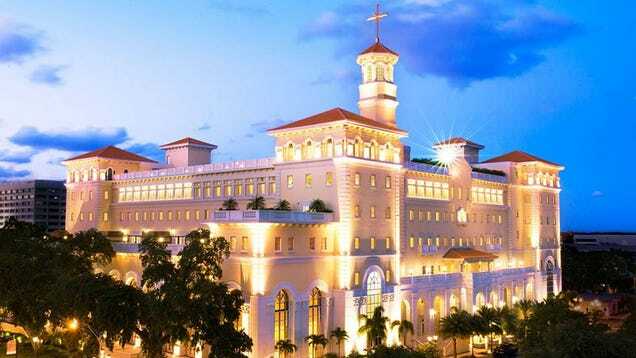 Since it was founded in 1955, Scientology has purchased hundreds, possibly thousands of buildings. Just how many is tough to fact-check due to the church's many tenuously connected affiliates, but representatives did confirm to the Hollywood Reporter that the church bought 62 properties globally just in a five-year period between 2006 and 2011. The church owns several rural compounds such as Gold Base, a 520-acre former resort in the desert east of LA that has been turned into a training facility. But many of Scientology's most prominent holdings are found on busy corridors in the centre of cities worldwide. While these urban enclaves in places with high population density help the church increase its visibility (the oversized garish signage helps, too) it turns out there is also an architectural agenda behind these purchases. Representatives of the church have commented that it is indeed part of the church's strategy to buy and rehabilitate ageing historic buildings, which in turn helps them to be seen as valuable community partners. Of course, this plan doesn't always pan out. So with all of that in mind, here are some of Scientology's most audacious brick-and-mortar assets. All photos (and their corresponding embellishments) courtesy of the Church of Scientology. The church owns at least two dozen historic properties in the Los Angeles area, including four of the largest buildings on Hollywood Boulevard. Some, like the former Hollywood Savings and Loan building seen here are blatant in their evangelical intentions, others like the Psychiatry: An Industry of Death Museum aren't as obvious. But it's not all gorgeous Beaux Arts towers: the church also owns plenty of crumbling stucco apartments which it uses to house its newest recruits and shuttle them in unlabelled buses to the towers for work. Director Paul Haggis, whose very public break from the church is featured in the film, says he lived with four other people in one of these apartments when he first moved to LA. Perhaps the most famous Scientology address is this 1927 replica of a French-Normandy castle at the base of the Hollywood Hills. 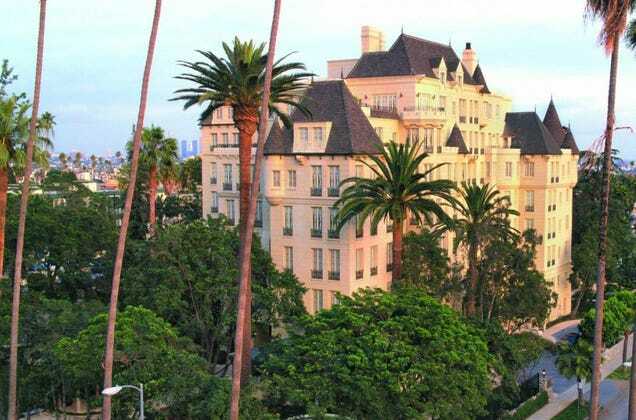 Originally named the Château Élysée, the hotel was built for actors who needed long-term accommodations while shooting films nearby and hosted most of the major stars of the era. Now it's an event centre and provides housing for Scientology's many industry acolytes. For the adventurous: anyone can have brunch in the building's Renaissance Restaurant. Nearby in Hollywood terms is the church's LA-based headquarters, housed in the 1976 Cedars of Lebanon Hospital (the building is known as "Scientology Hospital" to locals). 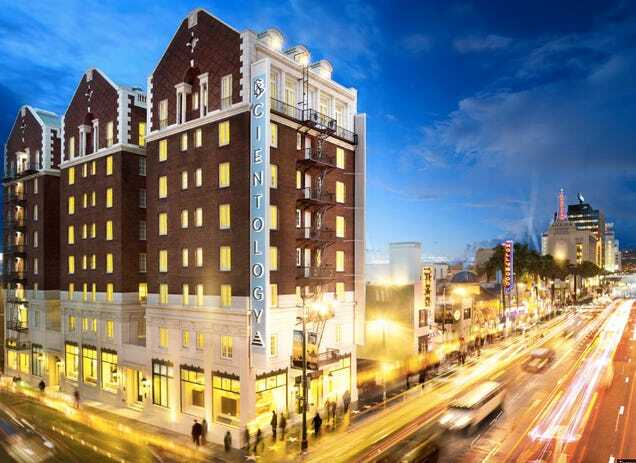 In 2010 the church restored the building, paved an adjacent street with cobblestones and named it L. Ron Hubbard Way, and painted the complex in a bright Scientology blue. If you catch the giant sign on the roof at just the right angle (the image at the top of the story), it lines up perfectly with the Hollywood Sign. Coincidence??? 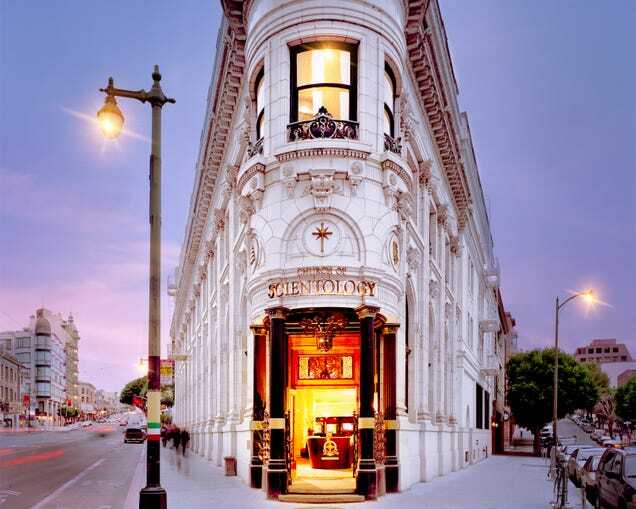 Scientology's purchase of landmark buildings around the world began in earnest in the 1960s. In fact, it was in 1968 when the church renovated the original Transamerica Building in San Francisco, a famous 1909 structure with its signature Flatiron-like shape. As in many cities, this Scientology centre is situated in a high-traffic pedestrian area which is also a popular tourist destination. In 1955, L. Ron Hubbard himself negotiated the purchase of the first US outpost of the church, not far from the White House. This was another cunning move that helped to position the group as a legitimate religion: the building Scientology purchased is located on "Church Row," alongside the headquarters of many other religious denominations. 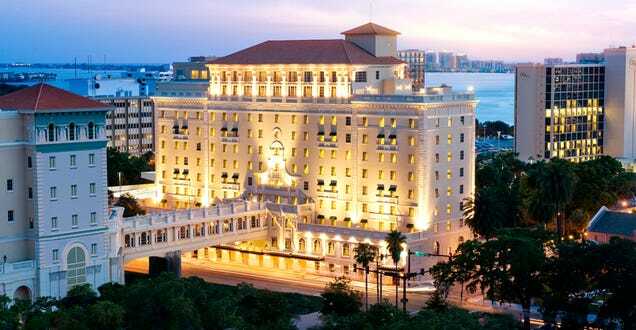 Although Hollywood might be the spiritual heart of Scientology, the official global headquarters consumes the downtown of the Florida city of Clearwater. The largest church complex on the planet serves as a pilgrimage site and religious retreat, staffed by over 1,000 followers. The 1920s hotel had fallen into disrepair when it was purchased by the church in the 1970s, and in 2009, it opened as one of the first renovated buildings completed in the downtown. 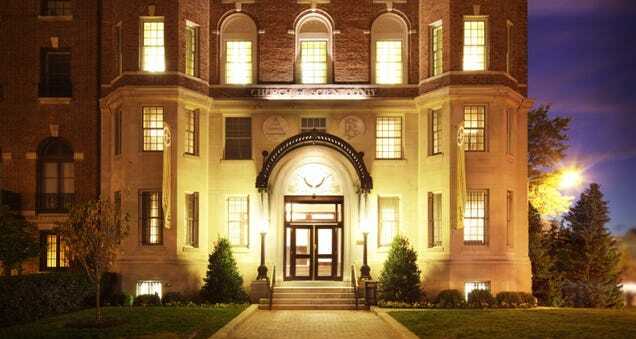 Opened in 2013, Scientology's world headquarters is one of its few major buildings which was constructed from the ground up (yep, it just looks historic), although it has taken over 20 years to complete the building due to construction and permitting delays. Also called the Super Power Building, it is the largest building in Clearwater, consuming a full city block, and includes amenities like an anti-gravity simulator and something called a pain station. Ouch.